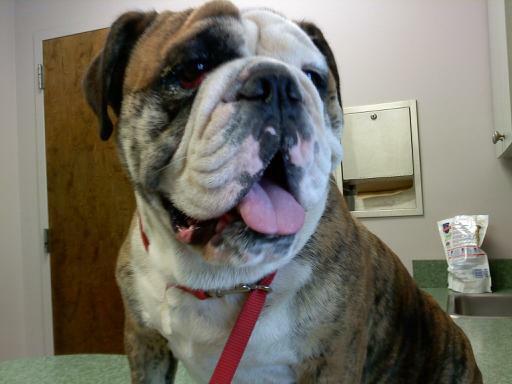 Search and adopt a English Bulldog near you. A Bulldog is the common name for a breed of dog also referred to as the English Bulldog. The Bulldog is a muscular heavy dog with a wrinkled face and a distinctive pushed-in nose. A typical mature male is about 55-60 pounds and that for mature females is about 45 pounds for a Standard English Bulldog. Temperament Despite their famous "sourpuss" expression, Bulldogs are generally docile and easy to please. Breeders have worked to breed aggression out of the breed, and as such, the dog is known to be of generally good temperament. Due to their friendly, patient nature, Bulldogs are known for getting along well with children, other dogs, and pets. Like all dogs, Bulldogs require daily exercise. If not properly exercised it is possible for a Bulldog to become overweight, which could lead to heart as well as joint issues. Bulldogs are very sensitive to heat. Extra caution should be practiced in warmer climates and during summer months. Bulldogs must be given plenty of shade and water, and must be kept out of standing heat. Air conditioning and good ventilation is required to keep them healthy and safe. The oldest single breed specialty club is The Bulldog Club (England), which was formed in 1878. Members of this club met frequently at the Blue Post pub on Oxford Street in London. There they wrote the first standard of perfection for the breed. The English Bulldog breed is the official mascot of the United States Marine Corps.